Bosch Packaging Technology will exhibit two new filling technologies for dairy producers at this year’s interpack event in Germany. Bosch will showcase Osgood rotary filling and sealing machine and Ampack FCL aseptic linear filling and sealing machine for pre-made cups. Bosch will unveil Ampack’s new FCL 3080 A aseptic linear filling and sealing machine, which can be used in dairy, baby food and clinical nutrition applications. The machine feature smaller aseptic chamber that enables to improve product control and minimize the risk of food contamination. 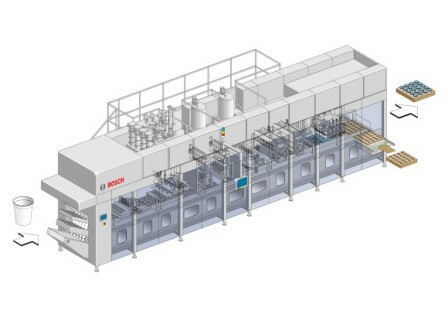 With speeds of up to 20,000 cups per hour, the eight-lane linear filler can be used to produce two different cup formats with diameters ranging from 75mm to 95mm. The new machine holds capacity to fill a range of products with particles up to 22mm in diameter. Available in two different hygienic executions such as ultra-clean or aseptic, the machine is suitable for products that need longer shelf life ranging from four to six weeks or up to 12 months. Bosch will also showcase an upgraded version of its existing Osgood rotary series for dairy and other food applications, including hummus or potato salads. The machine has been designed to handle smaller cups at speeds of up to 9,600 products an hour on four lanes, a better choice for producers with limited space. Osgood machine, which holds capacity to fill a range of different pack styles, is available in both clean and ultra-clean execution forms. Ampack Germany sales managing director Markus Schlumberger said: “The two filling technologies – rotary and linear – complement our existing portfolio for the whole output range and help us respond to various production needs. Image: Bosch will debut Ampack’s new aseptic linear filling and sealing machine at interpack 2017. Photo: courtesy of Robert Bosch GmbH.